K-City is part of a global effort to bring advanced self-driving technology to more vehicles in a favorable time frame. Highlighting its goal to be a major player in the development of self-driving car technology, South Korea this week announced plans for K-City, a specially designed 88-acre site set to be the world’s largest test space for autonomous vehicles. Slated to open this fall, K-City will comprise a network of roads and junctions that’ll give engineers more freedom for testing their technology in road conditions that mimic real-life scenarios. K-City will be open to a slew of local tech firms — among them Samsung, SK Telecom, and Naver, as well as automakers such as Hyundai and Kia Motors — allowing them to test and develop their respective technologies, Business Korea reported. The sprawling “city” is currently under construction and is expected to include expressways, bus-only lanes, zones for autonomous parking, and other features designed to help engineers work on improving autonomous driving technologies. While Samsung recently received permission to test its own technology on public roads in South Korea, likely using Hyundai’s Grandeur sedan (called the Azera in the U.S.), K-City would give engineers more freedom to carry out tests using different road scenarios and without disrupting “real” traffic or risking harm to regular drivers. For sure, autonomous cars on public roads occasionally get into scrapes — some more serious than others — but often the accident is the fault of a human driver puttering along in another car. 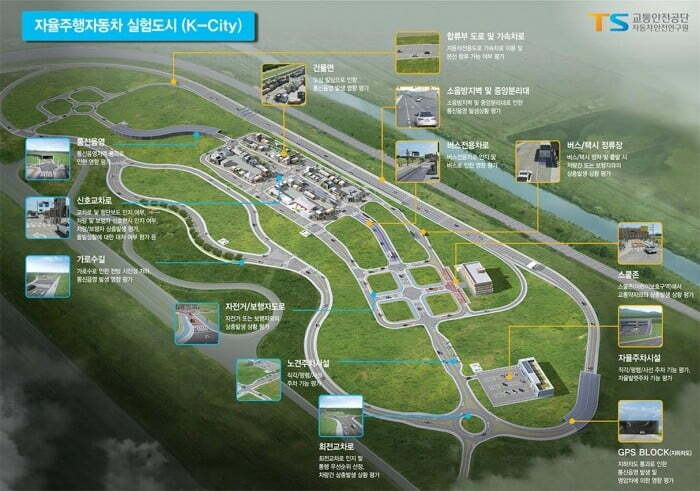 Facilities like K-City could be particularly useful if engineers are keen to try out a new piece of car-related software before taking it out onto public roads, while Business Korea also points out that the site could be useful for the collection of large amounts of driving and road data, potentially benefitting urban planners and insurance companies. Besides being a vital facility for the development of autonomous driving technology, K-City is also South Korea’s way of putting competing companies around the world on notice that it’s determined to be at the forefront of the platform’s development, spurring innovation by encouraging Korean firms to collaborate in one location. In the U.S., the largest testing site similar to K-City is the University of Michigan’s 32-acre MCity facility, which is less than half the size of South Korea’s under-construction site. But both are set to be dwarfed by the American Center for Mobility at the historic Willow Run site near Detroit, Michigan, a facility that’ll cover a whopping 335 acres when it opens later this year.